Peace will engulf you when you are ready to release that which no longer serves you. IAM the thorn which pierces the ♥Sacred Heart. A mystic once told me “Rebecca, endurance is part of your life path….revealing many life lessons for you…. and for others.” Let’s just say I wasn’t very excited about this disclosure. I was sure my lessons of endurance were behind me when I sat before him years ago. Who would intentionally choose endurance as a life path? Certainly I meant a life path of Excellence, or Endearment, or my all time favorite, Ease & Grace. Not happening. Those life paths were being traveled by more fortunate souls. 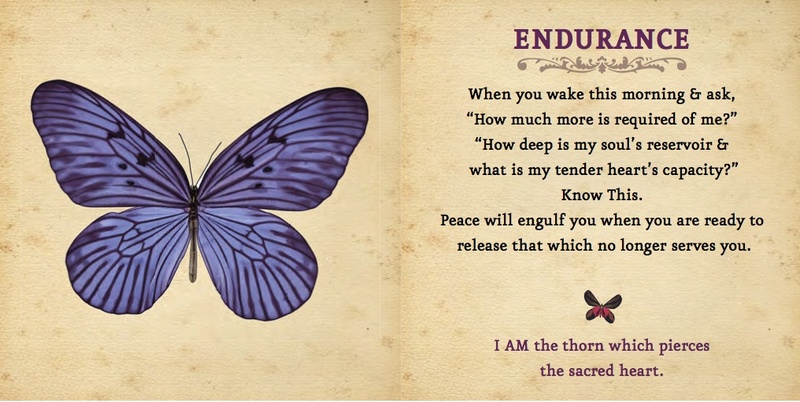 But as I read this morning the wisdom within the words of this Endurance Card and it’s powerful closing line: IAM the thorn which pierces the Sacred Heart…. The symbolic images within those lines sparked my awareness and I have a sudden deep appreciation of this life path. What are the ‘thorns’ over the years that have pierced my protected heart? Fear of bleeding, or grieving, or releasing broken dreams. And what gifts of wonder were revealed to me upon its initial piercing? It was the initiation of the sacred heart. This entry was posted in Emerging Soul Cards and tagged Being in past, Endurance, initiation, letting go through grief, premonition, present & future at same time, Sacred Heart on August 11, 2015 by Rebecca Winters Rodriguez.